November’s APEC summit in PNG saw the Australian government increase its efforts to buy influence in the Pacific, with a raft of announcements designed to counter China. Scott Morrison had already announced that Australia would help expand PNG’s naval base on Manus Island, turning it into a joint facility used by the Australian navy. At APEC, US Vice President Mike Pence added that US would share in the cost of the upgrade, with US Navy ships to dock there as well. Pence, in barely veiled code, said the base would be part of upholding the “freedom of the seas and skies”—hinting that it was part of containing China. 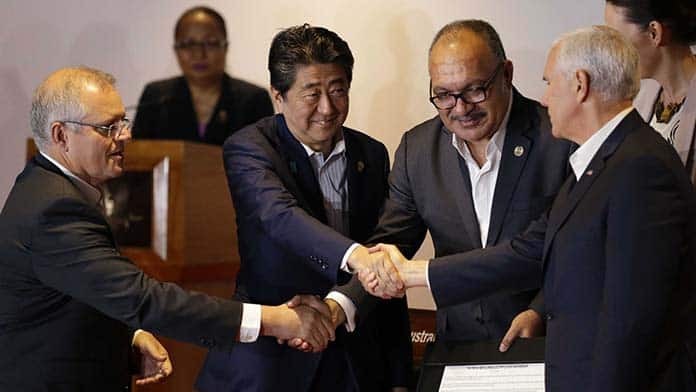 APEC also saw a promise from Australia, the US, Japan and New Zealand to roll out electricity infrastructure to 70 per cent of PNG by 2030. Earlier in November, Morrison outlined plans to “step up” in the south Pacific, committing $2 billion to fund infrastructure projects and opening new diplomatic posts. The PM said, “This is our patch where we have special responsibilities.” He denied the moves were designed to counter China. But Australia’s rulers have always seen the south Pacific as crucial to “forward defence” and sought to keep out other powers. Morrison wants to use Australian aid to strengthen the security relationship with Vanuatu—where China was reported as wanting to build a naval base. In April, then PM Malcolm Turnbull met with the Vanuatu Prime Minister, Charlot Salwai, to get an assurance from him that he would “never allow” a Chinese-funded port in his country to be used a military base. Turnbull also sought out the Solomons Island PM, Rick Houenipwela, to assure him Australia would fund an undersea internet cable, in order to freeze out a rival bid by Huawei, the giant Chinese telco. Labor is also committed to spending up to neutralise China’s influence. Bill Shorten laid out his own plans at the end of October, promising to increase foreign aid to the region and facilitate greater private investment in development projects to ensure Australia is the “partner of choice”. We should oppose the imperialist jockeying in the south Pacific, and Australia’s efforts to dominate and control the region.